The classic seaside shoe to refresh your summer style. Maybe they’re plastered with beer logos like they belong in a NASCAR race or maybe it’s proudly bedecked with the stars and stripes. The sole may even have a built-in bottle opener… because why wouldn’t you want to open a beer with something that’s been touching the ground all day? No matter what’s on them, they’re almost certainly worn down under the toes and shaped to match the contours of your feet. Now’s the time to rid your closet of those old sand-flaked flip flops and pick up the grown-up alternative: canvas espadrilles. You’ve probably seen them more often than you realize. Classic summer footwear with a centuries-old pedigree, the canvas espadrille keeps your foot covered but cool in warm weather. After all, no one wants to see your toes. You don’t even want to see your toes. Espadrilles may be one of the oldest forms of footwear still worn today. Although thought to have existed in some form for thousands of years prior, it was a document in 1322 that first documented “espardenyes,” the Catalan name for this regional shoe soled with esparto grass. Esparto is a tough grass used for making rope. As esparto is endemic to the Western Mediterranean, France and Spain pioneered the manufacture of esparto-soled shoes, and the word “espadrille” itself is derived from the Occitan language spoken in southern France’s Occitania region. Espadrilles’ rising popularity during the 20th century meant that some makers needed to find a more cost-effective replacement for esparto rope. Jute, an off-white vegetable fiber common to Bangladesh, is roped or braided to create the soles of most modern espadrilles. 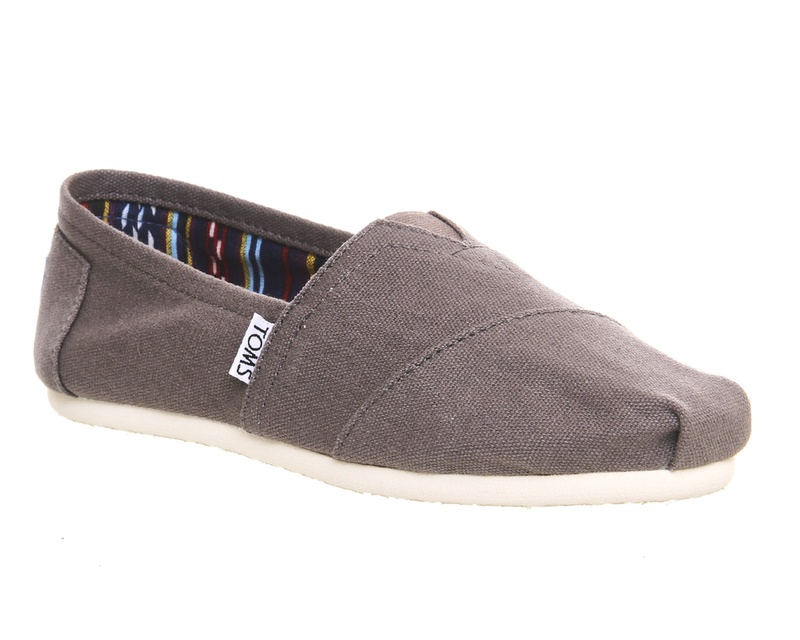 Bangladesh even exports jute to areas like France or Spain where the original esparto-soled espadrille was born. 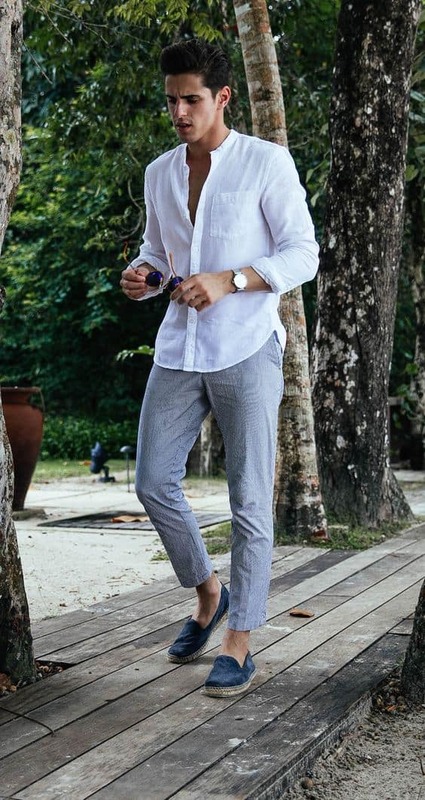 Like all fashion, the espadrille’s popularity is cyclical, making cultural appearances on the feet of Sean Connery’s James Bond in the mid-1960s and twenty years later as the pedi-complement to Don Johnson’s pastel suits as Sonny Crockett on Miami Vice. (Not that we’d necessarily recommend Sonny Crockett as a paragon of timeless style.) Now, espadrilles are again on the rise for another menswear comeback in the 2010s. With some variations, the standard espadrille resembles a one-piece slipper with a rope sole. Uppers can be canvas or cotton fabric in any color or pattern, but it’s the distinctive esparto or jute rope sole that distinguishes an espadrille from its summer footwear brethren. 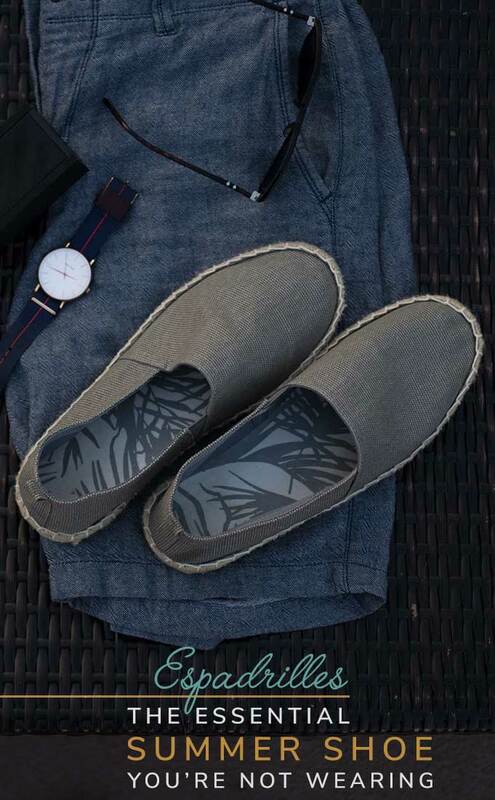 While espadrilles certainly do have unisex appeal, its fondness among masculine icons like Humphrey Bogart, Ernest Hemingway, and John Wayne proves that there’s nothing wrong with wearing a shoe that will make your girlfriend proud to join you for those proverbial long walks on the beach. 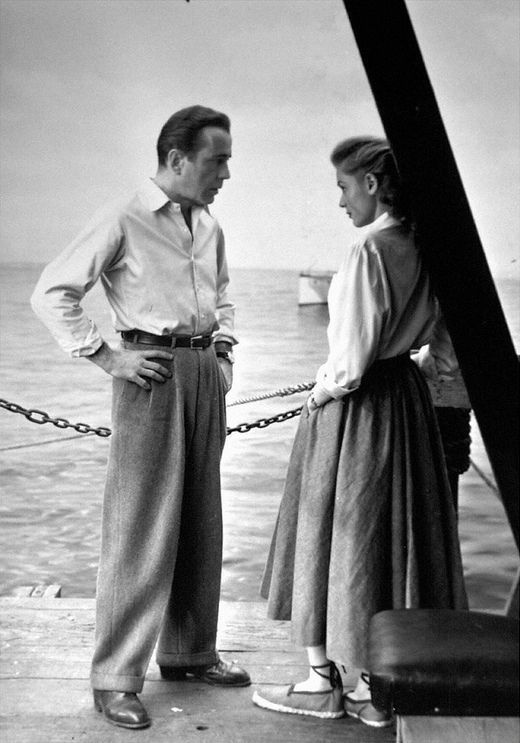 The most common type of espadrille is a slip-on shoe with simple construction, however some are made with exposed heels and cage-style laces around the ankle as Lauren Bacall wore in Key Largo. 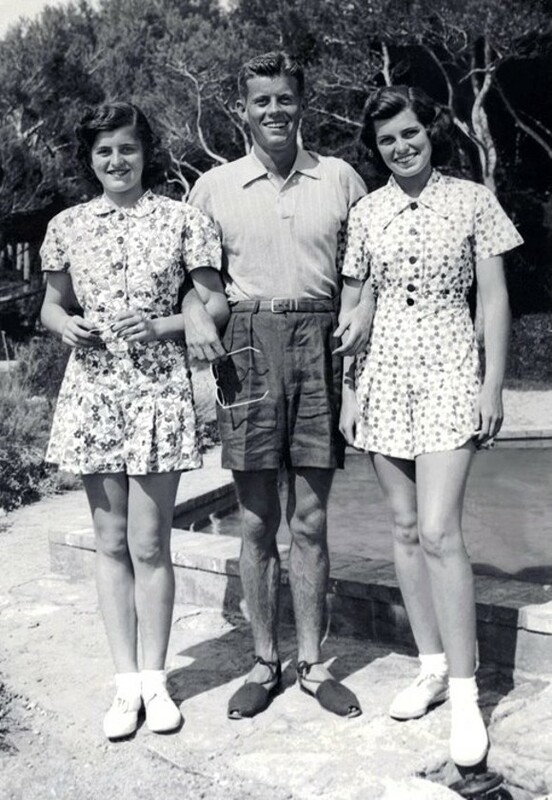 (Evidently, espadrilles were the favored casual shoe for both Mr. and Mrs. 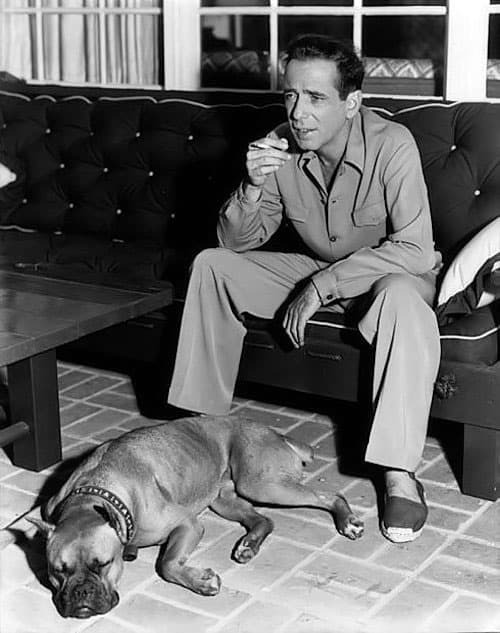 Bogart.) This latter style is more frequently found on espadrilles marketed to women although they do share similarities with these Basque-laced shoes worn by a young John F. Kennedy. 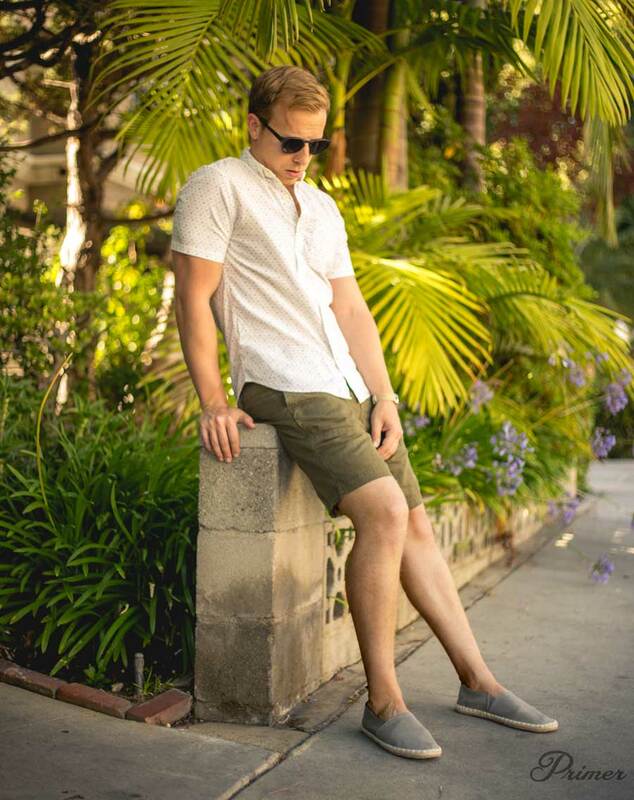 Of course, you don’t need the swagger of Bogie, Papa, or Duke to pull off espadrilles with aplomb. “The grass was lush underfoot after the pine-needle floor of the forest and the dew on the grass wet through their canvas rope-soled shoes.” – Ernest Hemingway, For Whom the Bell Tolls, Chapter Three. The closer you are to water, the better you’ll look in espadrilles. In fact, they’re the only footwear you should need to pack for a weekend at the beach. They may be rigid at first, but the more they’ve been worn (by you! 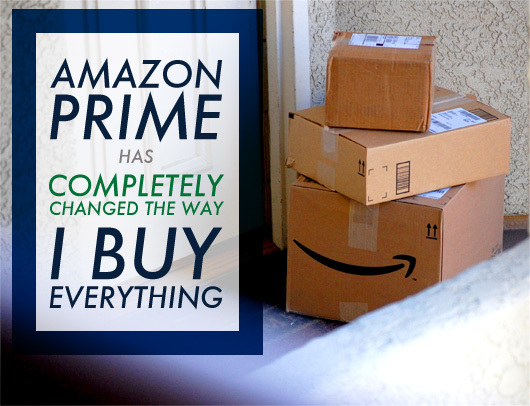 ), the better they’ll feel each time you slip them on. Plan on wearing them sockless (or with a pair of no-show socks for the same “sockless look”), which also means taking some easy measures to keeping them fresh. Remember our Ziploc-baggie in the freezer trick with the boat shoes? Works just as well with your espadrilles. 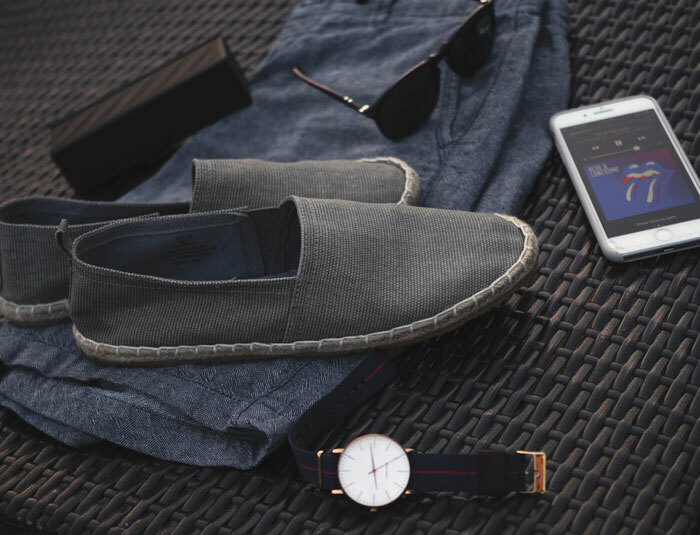 Built for keeping your feet covered but cool in warm weather, espadrilles are the perfect complement to clothing that does the same job such as shorts or summer-weight cotton or linen trousers. Espadrilles look equally great with swimming trunks at a pool party as they do with a linen suit at a beach wedding. Not sure yet if espadrilles are for you? Try this affordable pair shown above from H&M for $18. 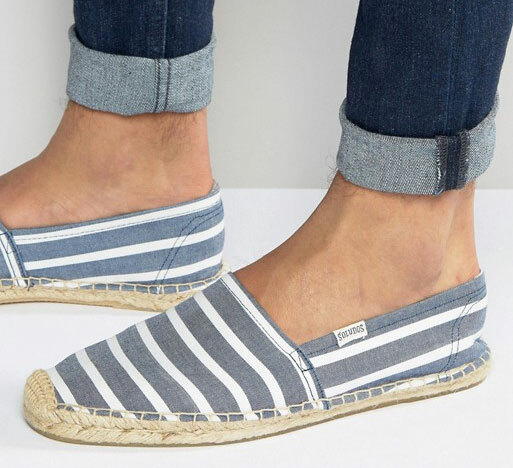 If you want a pair that you can trust to last several summers, Soludos and Viscata are two brands that offer well-regarded espadrilles in the affordable range of $35-$55, available from Amazon. In addition to classic shades of blue, taupe, and gray, rose pink and striped canvas espadrilles are available for the more daring wearer. 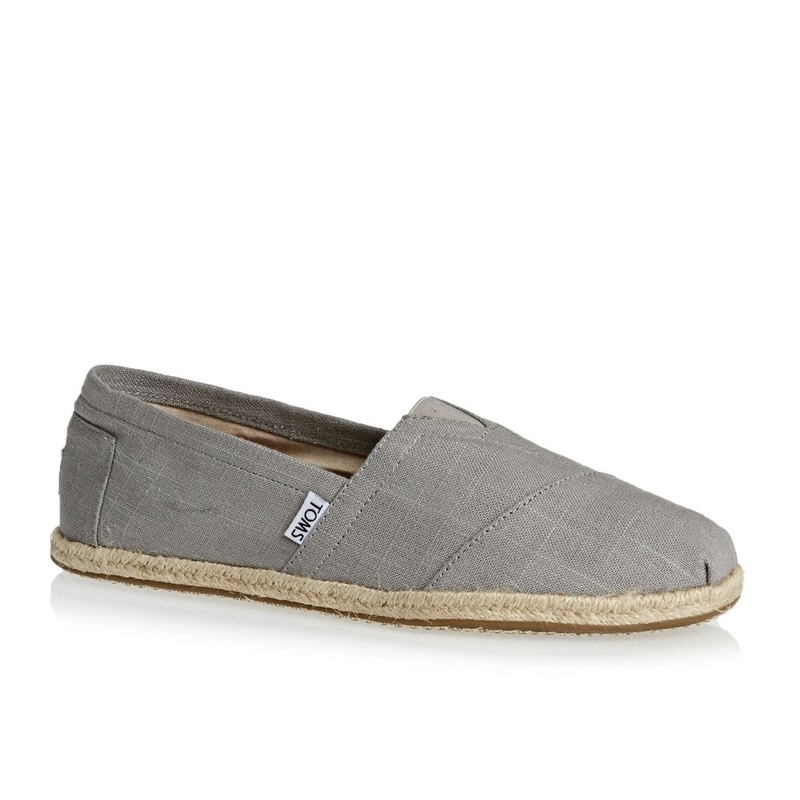 Have you incorporated espadrilles into your summer style? I love this style shoe! I bought a pair of “alpargatas” in Argentina a couple years ago. That’s actually where TOMs was inspired. But looks like they go even further back! I bought a pair of soludos years ago on sale. I wore them until holes started forming. The best pair of shoes I’ve ever owned. I’d argue that Sonny Crockett’s style was quite timeless for the time. 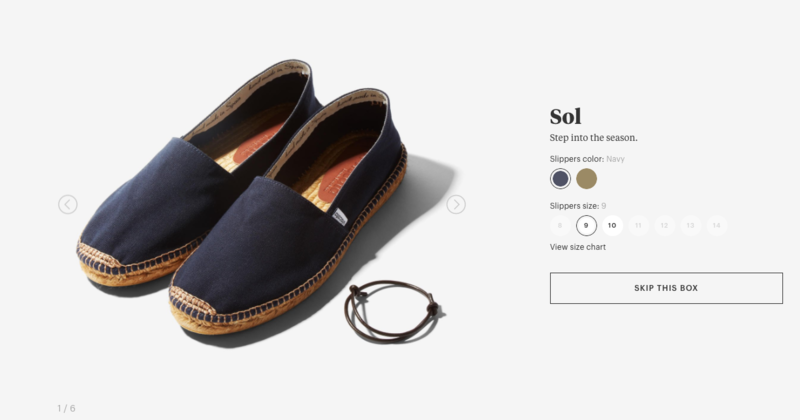 The next getup looks great, I really like how espadrilles bridge the gap between loafers and boat shoes, as a casual summer shoe. What an apropos subject. I’ve just been learning about espadrilles shoes. Now all I need to know is how to pronounce it. Thanks for the info and budget options! Those H&M ones went *fast*, didn’t they? My Bespoke Post box this month is a navy pair. I had my eye on them last month-glad they didn’t run out! I discovered espadrilles last summer and wore them so much they basically disintegrated. Buying a new pair was the first thing I did to get ready for this summer. Just picked some up from H&M, thanks for the recommendation! I would just like to say that it’s incredibly refreshing to see so many other young men like myself show reverence for some of the my many idols such as John Wayne, Steve McQueen and Ernest Hemingway. It’s nice to know that I’m not the only one keeping the memory alive in our generation, especially considering that Primer is so much more than just fashion but a true guide to living well and happily as a male Millennial. So, to you Nick,and the other contributors on this site, I extend my gratitude. Thanks so much Alex, you just made my day! 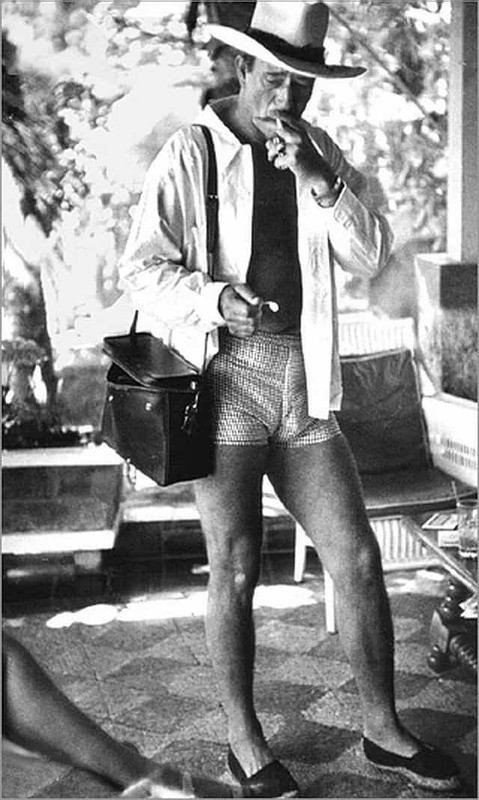 I would just like to say that it’s incredibly refreshing to see so many other young men like myself show reverence for some of the my many idols such as John Wayne, Steve McQueen and Ernest Hemingway.